An aviation safety expert was “grilled” by lawyers for the Ontario government and the wind power developer. He maintains that the planned Fairview Wind power project represents a clear danger to airport operations and pilots. Charles Cormier says Mega Turbines simply too close to Collingwood airport. (Collingwood) – An aviation consultant returned to the stand at the Environmental Review Tribunal in Collingwood today. Lawyers for the Ontario Ministry of the Environment and Climate Change and WPD Canada cross-examined Charles Cormier, who was retained by the municipalities fighting mega wind turbines. Charles Cormier testified that the turbines planned at the Stayner-Clearview field will be very dangerous to normal flight operations. He said with pilot multi tasking all the time, a catastrophe is likely with the turbines so close to the approach to the runway. Cormier said if the turbine is built in the approved location, the start point for approaches at the facility would have to move 4-thousand feet, well beyond the existing property boundaries. Citing studies that blade turbulence from the turbines can extend out 15 diameters of the rotors, Cormier said the entire aerodrome would exhibit severe potential for aircraft accidents. Lawyers representing the turbine developers have argued that planes can make their landing approaches from a higher altitude to avoid the turbines. But Cormier told the hearing he designs approaches to bring planes in as low as possible to inspect the runway for vehicles and wildlife. When obstacles are placed in the way, the only alternative is to make the approaches higher. But, at 1000-feet, Cormier said, an aircraft may still be in cloud and unable to see what’s coming. Cormier said there is not enough land available to mitigate the problem, so the investment in the aerodrome would be lost. Both counsellors suggested that Transport Canada letters on the subject said safety concerns could be addressed by lighting the turbines. But Cormier said the turbines are simply too close. 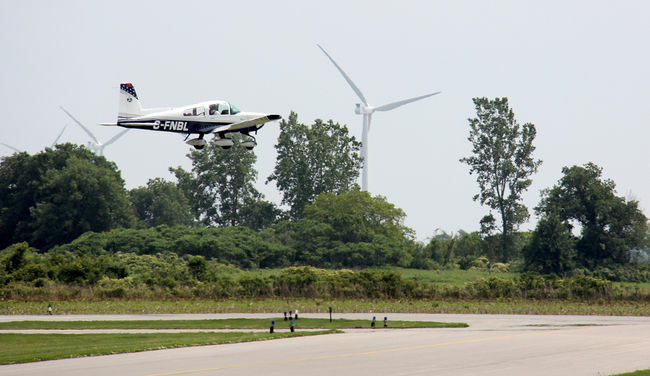 He cited Chatham-Kent were 19 turbines were cancelled because they presented obstacles to the airport. In that case they were planned at 1 to 1.3 miles from the flight path. At Stayner-Clearview they would only be .4 of a mile away.